Your favorite superheroes from the Marvel Comics universe come to Disney Infinity! 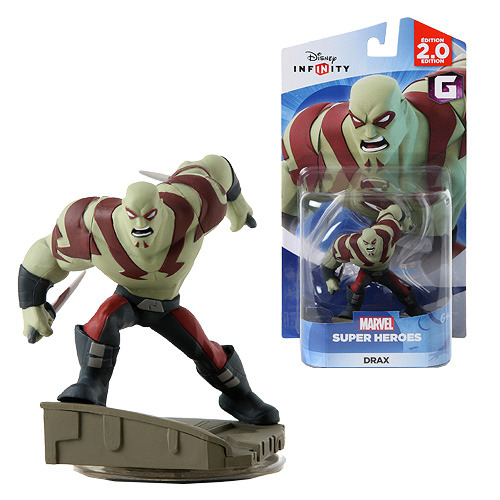 This Disney Infinity 2.0 Drax Figure will help you continue your Disney Infinity adventures with Marvel's Guardians of the Galaxy! In Disney Infinity: Marvel Super Heroes, players will use real-world interactive Marvel figures to activate original storylines (Play Sets) in the virtual game worlds of some of Marvel's most popular franchises, including The Avengers. In the Play Sets - penned by award-winning Marvel comic writer Brian Michael Bendis - players will be able to take on the role of more than 20 Marvel characters including Captain America, Iron Man, Black Widow, Thor, Hulk and Hawkeye to battle enemies, complete challenging missions, solve puzzles and ultimately save the world from destruction. Measures about 4-inches tall. Ages 6 and up.